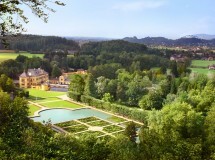 Salzburg is a mere 30 minutes away by car, and is also easily accessible via public transportation. A sightseeing trip to Salzburg is definitely worthwhile. A sampling of the many attractions: the old city, the Dom, the fortress Hohensalzburg, Mozart’s birthplace and residence, the Hellbrunn Palace with Wasserspiele (“water games”) and neighboring zoo, and many splendid museums.